Of boxing’s 17 weight-class divisions, Manny Pacquiao has won eight. What’s next? A clash against Wladimir Klitschko, all of 6-foot-6 and 245 pounds? Maybe that one-foot height advantage and 100-pound weight difference will finally matter! MP possesses everything. He endures a brutal training regimen. That’s called hard-work. He owns an insatiable appetite for digesting pain—absorbing wooden sticks that flagellate his torso and crunching 10,000 sit-ups. He has focus. Humility. He’s devoted to God, kneeling down for prayer upon climbing the Dallas stage and repeatedly making the sign of the cross as if to pray, “Forgive me, Father, as I punch this—” Bang-bang-bang-bang! Because if there’s one new quality we’ve learned about Pacman—the world saw it on display last weekend. We know Pacquiao’s killer instinct. His impulse to jump on the half-naked man and paint his white face red. He throws six punches in the wink of his opponent’s brown eyes. He is more offensive than Mike Tyson; scores more points than Kobe Bryant. Yet, for all of this “Mexicutioner” style and how he delights in slaughtering enemies—for all of his lion’s heart—we saw a different heart from Manny. His heart of compassion. For what would have happened had our Filipino lacerated and slashed the Mexican in the last six minutes? The Tornado would have twisted, curled, warped. His fractured eye socket—which needed immediate surgery—might have led to worse: Brain injury? A mind that will forever be sleeping in a Tijuana hospital bed? A debilitated and paralyzed body? Who knows? Bobby Nalzaro said it perfectly yesterday: Manny had pity. For MP to have the sense in the middle of war to disarm himself, to hide the bullets, to assess his enemy’s damage, and to grant clemency to Margarito… why, that’s heroic. It showed us his true character. It showed the world how a Filipino can fight—yet not be cannibalistic. It showed concern and sympathy—words never, ever used in the sweat shops of boxing. It’s called heart. A heart with two faces: that of a fighter and that of a humane person. Thinking back on the historical magnitude of Manny Pacquiao’s achievement—and our good fortune to have witnessed it—we can’t clap or cheer enough on his first 10 rounds of boxing. His skill. His footwork. His Gen.San-bred granite chin. His power. His speed. But, to me, the new Pacquiao was defined in those last two rounds. 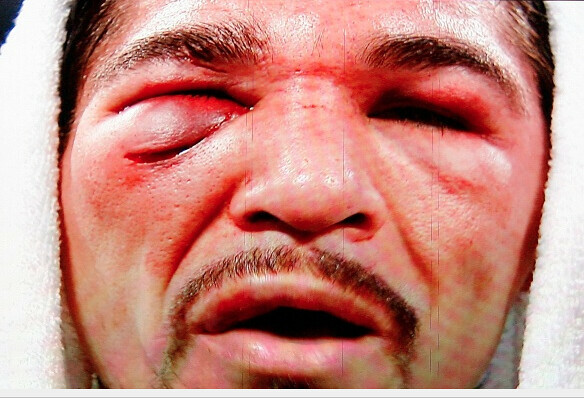 The face of Tony Margarito was brutalized and disfigured—and Manny could have killed him. Yet, he danced away. For Manny is no killer—only his instinct is. What compassion from a Filipino. terrific column this morning. I was sitting at the club with many from the Filipino community here on the Central Coast. Of course they were going ballistic from the time Manny started to walk towards the ring. You are right about the last two rounds with regards to the way Manny finished the fight. I watched him closely at the start of the last round and he really showed that he did not want to begin that round. Like you said he had words with the referee who ignored him. The problem for Manny in that scenario was with all is dancing around the ring nobody told Margarito what was happening. 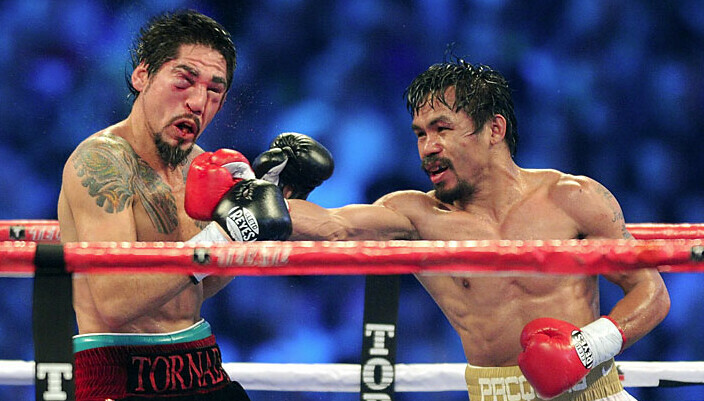 So Margarito’s bull headed, courageous, refusing to give in attitude could so easily have derailed Manny’s humane act. Several times in the last round as Manny backed off Margarito caught up with him, so Manny was forced to unleash a flurry punches and skip away again in an attempt to slow Margarito down. Manny did run the risk of being caught by a haymaker from Margarito all in the name of sportsmanship. Is there the possibility of a slogan MAN.NOY in a few years time to replace P.NOY??. what better way to describe Our World Champion and kababayan. it’s comical, yet maybe true. A true champ isn’t only measured by the number of wins but also how he handles himself. and Pacman has shown this on Saturday, almost asking the referee to call the fight and save Margarito from further pummels. GRAEME and JYM…. THANKS A LOT! 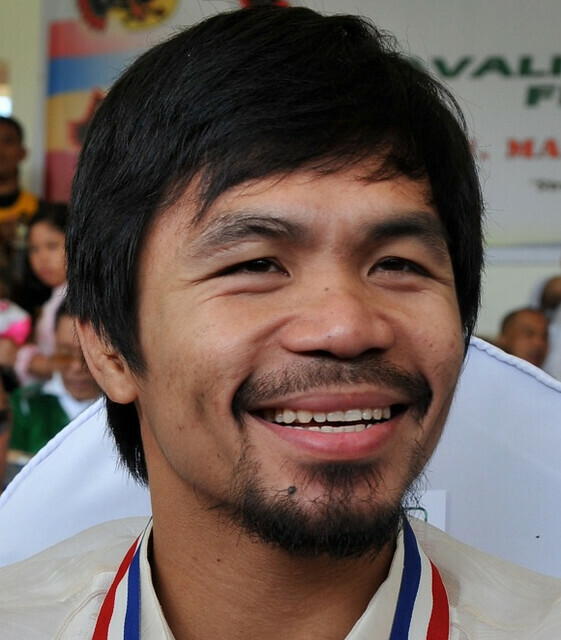 It’s harder to find a Manny Pacquiao replica than it is to win the P500 million lotto. This billionaire’s a one-in-a-billion!